Most of Walt Disney's live action films were period films, but by the early 1960's he had produced a handful of modern comedy films. What sets Moon Pilot apart is that it is somewhat political. It's based on a serial from The Sunday Evening Post called Starfire by Robert Bruckner, which was packaged as a novel to go along with the film release. The Disney film is just as satirical, poking fun at the FBI, US Air Force and the astronaut program all at the same time. It's interesting to note that in the mid 1950's, Walt had several episodes of Disneyland devoted to the possibilities of space exploration and the Tomorrowland section of his theme park was all about a future in which man could walk on the moon. It's clear that he must have been dissatisfied with the progress that had been made. To direct the film, Walt hired James Nielson, who had primarily been a television director and had done two episodes of Zorro for Disney. This was his first of several Disney films. Walt's son-in-law and future head of the studio, Ron Miller, has his first producing credit on this film. Tom Tyron was a familiar face for TV audiences and had played the lead in Walt's serialized version of Texas John Slaughter. His love interest is played by Dany Saval, a French actress making her US film debut. This is the only Disney film either ever made, but the rest of the cast has a few familiar faces, including Brian Keith and Tommy Kirk in a "guest starring" role. Bob Sweeney will also be a familiar face to anyone who saw Toby Tyler. Maurice Tombragel adapted the serial into a screenplay, after being a TV writer for several Disney productions. Filming took place mostly on location in San Francisco, with some scenes shot on the Disney Studio backlot. Three songs were written for the film by the Sherman Brothers: "The Seven Moons of Beta Lyrae," "True Love's an Apricot" and "The Void." However, only "The Seven Moons of Beta Lyrae" is a full song. The rest are sung by beatniks with no accompaniment. The film begins in the control room of the astronaut program as they prepare for a shuttle to land. And air force plan grabs the cargo that is jettisoned and a chimpanzee named Charley emerges, having returned from the first trip to orbit the moon. The general decides that he now wants to send a man on the same trip and asks for a volunteer and he wants the trip to take place this week to beat other nations that want to be the first to the moon. When Charley pokes Captain Richard Talbot in the back, he accidentally volunteers himself for the top secret mission. He flies home to visit his family and on the flight, he meets a strange girl name Lyrae who somehow knows all about the mission. After telling the general the FBI takes Talbot into their protection, but Lyrae gets to him anyway to warn him that the mission will put him in danger and he leaves with her. She gives him a formula for a solution that will protect him when the space shuttle is coated and reveals that she is an alien. Romance begins to bloom between them, but Lyrae disappears when the Air Force takes him. After blasting off for his space mission, she mysteriously appears on his ship. She invites him to her planet and they take off singing, much to the disdain of the general. 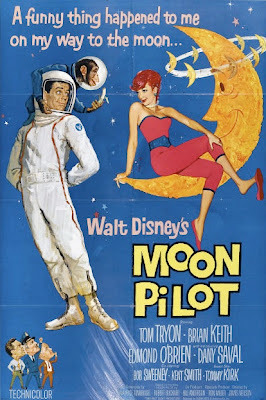 Moon Pilot premiered on February 9th, 1962 and entered wide release on April 5th of that year. Critics were pretty positive towards it, enjoying the political satire (and even praising the chimp for making it appealing to kids). And while it wasn't a huge success at the box office, it cost very little to make and turned a profit. A full episode of Wonderful World of Color was devoted to promoting the film called "Spy in the Sky." The film was never rereleased in theaters, but made its TV debut in 1966 and had its first home video release in 1986. I first saw Moon Pilot a few years ago on a secondhand VHS I bought from a video store. The film is very slow to start and it lost my interest then. However, I enjoyed it much more this time around. Its biggest problem is that the title of the film suggests that there will be a great deal of time spent in space, but most of the film takes place on Earth so I was expecting a completely different kind of film. For a comedy, it only made me laugh once during a police suspect line full of beatnik girls (which features an uncredited Sally Field in her screen debut). However, the story is charming if the viewer is patient enough to make it 40 minutes in when the plot gets interesting. The FBI allegedly approached Walt Disney to complain about their portrayal in the film. It has fallen into obscurity over the years and its not hard to see why. It's not very memorable and ranks low when compared to some of the amazing films the studio was releasing at this time. But it's not an entirely bad film and has some moments that are worth watching. 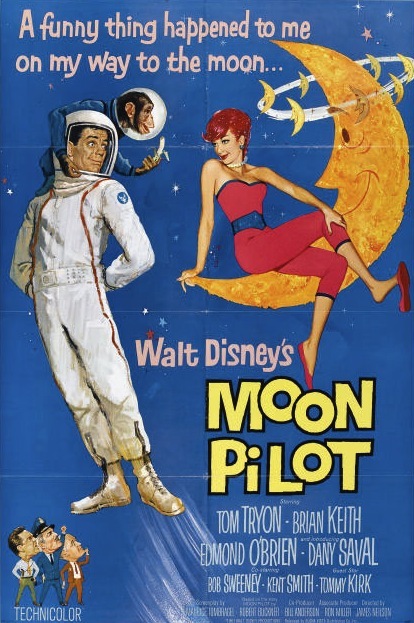 Moon Pilot is currently available on DVD as a Disney Movie Club Exclusive. The film is presented in pan & scan fullscreen, but it was filmed and originally presented in a widescreen aspect ratio of 1.75:1. The film looks clean, suggesting that a restoration was done prior to release. There are no bonus features. It is available on iTunes where it is presented in widescreen and HD. do you happen to know what movie short or cartoon played with this movie?